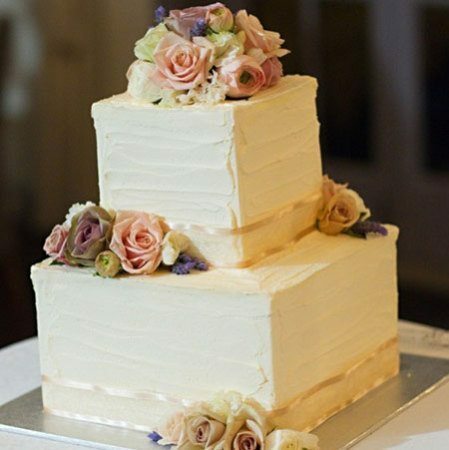 A beautiful two tier cube shaped wedding cake, iced in textured soft buttercream icing and decorated by our talented wedding florists in seasonal antique toned roses with a touch of lavender. Finished off with a champagne satin edge ribbon around the base of each tier. Delicious and divine! Order online or by contacting us at enquiries@bridesinbloom.com.au. Alternatively click on this enquiry link for a fully customised wedding cake quote within 48 hours. Provides 180 coffee sized servings for wedding guests. Minimum order cut off seven working days prior to wedding.